On Wednesday Apple not only issued iOS updates for the iPhone, iPod touch, and iPad, but also for the Apple TV 2 ( ). 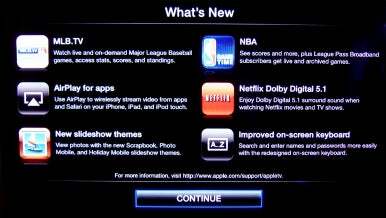 And, as with iOS 4.3 for Apple’s portable devices, the Apple TV 2’s 4.2 update includes new features including support for streaming sports content from MLB.TV and NBA League Pass. Additionally, the update offers greater support for AirPlay so that iOS devices running iOS 4.3 can stream video and audio from supported apps (now including Safari). There are now three additional photo slideshow themes—Scrapbook, Photo Mobile, and Holiday Mobile. The Apple TV’s Netflix component supports Dolby Digital 5.1 surround sound. And Apple has improved the onscreen keyboard layout so it’s easier to enter information. Of these improvements, the streaming sports options are clearly the most important. 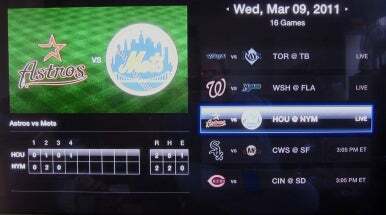 Found under the Apple TV’s Internet menu, select MLB.TV and you see a screen that lists Today’s Games, Standings, Team By Team, MLB.com On iTunes, and Settings. Select Today’s Games and you see a list of all the games being played today. To see games coming up in the future, just click the remote’s Forward button to move through the schedule one day at a time. Those games that you can watch are highlighted. Team logos and still images appear on the left side of the screen and the box score appears below the images. Select Standings and you see team rankings presented by division. In the Team By Team screen you can view a list of recent and upcoming games. If you’re a subscriber you can watch recent games by selecting a game and pressing the remote’s Play/Pause button. As you might expect, the MLB.com On iTunes command leads you to MLB.com content available at the iTunes Store. And finally, when you choose Settings you see two commands—Sign In and Scores. Select Sign In and enter your MLB.TV login ID and password. You can’t subscribe to MLB.TV directly from the Apple TV. You must first create an account via your Web browser. The price for MLB.TV remains $120 a year (or $25 a month) for MLB.TV Premium and $100 a year (or $20 a month) for the standard service. Existing blackouts still apply, so you can’t ditch your cable or satellite subscription and use MLB.TV to watch your local team. You can view scores and rankings without being a subscriber, however. The NBA entry is very similar. On its screen you see Games, Standings, Game Highlights, NBA on iTunes, and Settings. They work very much the way MLB.TV does. For $65 a year you can choose up to seven teams throughout the regular season, while $100 a year gives you access to all NBA team (blackout restrictions apply here too). AirPlay is now more widely available to apps others than Apple’s. Using it from within Safari is similar to its functionality with Apple’s Videos app. Just launch Safari, find a site that contains video, and look for the AirPlay icon in the video window. Tap the icon and select your Apple TV from the resulting menu. When you start playing the video, it should appear on the TV attached to your Apple TV. The update is available now on your Apple TV 2. Just choose Settings -> General -> Update Software. The update is not compatible with the original Apple TV.